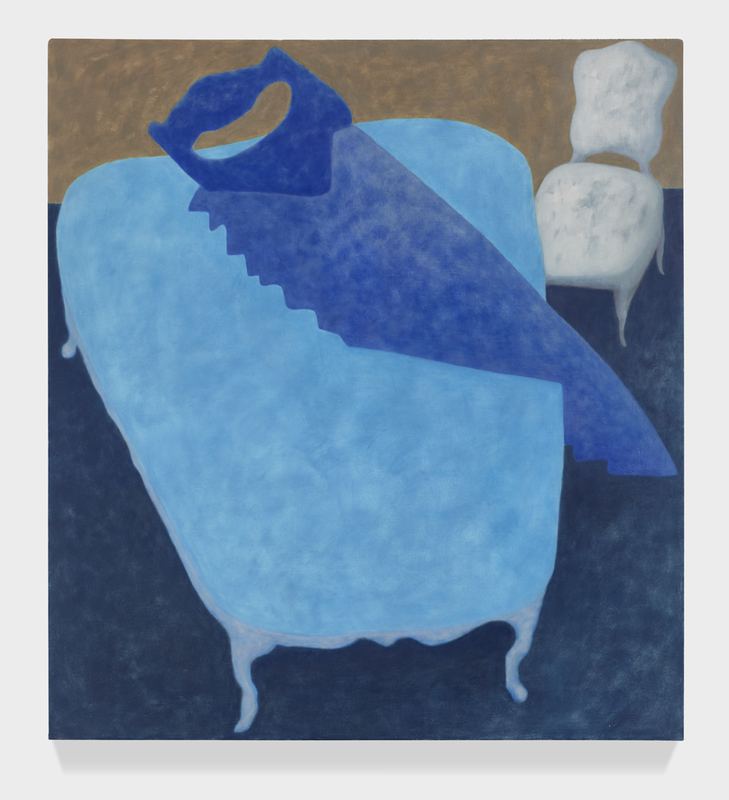 Ginny Casey, Moody Blue Studio, 2017, oil on canvas, 70 x 75 inches. Contributed by Becky Huff Hunter / It’s a common story of contemporary art for artists to describe abandoning the two-dimensional confines of traditional painting on canvas for the more immediate materiality of sculpture, installation, or performance. In her 2016 memoir, for example, academy-trained painter Marina Abramović recalls her decisive moment: “Why should I limit myself to two dimensions when I could make art from anything: fire, water, the human body?” New York-based painter Ginny Casey recently described a far less storied move in the opposite direction at an artist talk at the Institute of Contemporary Art (ICA), University of Pennsylvania, where her work is currently exhibited. Ginny Casey, Blue Table, 2016, oil on canvas, 32 x 30 inches. Casey initially worked as a sculptor and turned to painting so that she could create the kind of surreal environments that she imagined but was not physically capable of building. According to the gallery text, she now “builds sculpture with paint.” Her strange still lifes depict the tools and materials of a sculptor’s studio — knives and scissors, cuts of wood and lumps of clay, electric fans and ceramic vases — along with other, uncanny additions. Ginny Casey, Sculpture Studio, 2016, oil on canvas, 55 x 55 inches. In Moody Blue Studio, 2017, each depicted object —pink-and-blue table, black scissors, terracotta figure, hovering brown disembodied hands — appears to have been carefully outlined, painted in, and then outlined again. There are no paint drips or other markers of accident; there are hardly even identifiable brushstrokes because the painting’s surface has been sanded down to a uniform flatness, invoking a deliberate, uneasy calm. Layered blotches of color create mottled, muted dimensionality. The objects ground each other, as each of them touches at least one other object. The joined-up group floats, unanchored by shadow, against the vast dream space of the painting’s royal blue studio floor and cobalt walls. A single rectangular doorway, lit from below, pierces the dark wall and echoes the cutout doorways in the exhibition design. 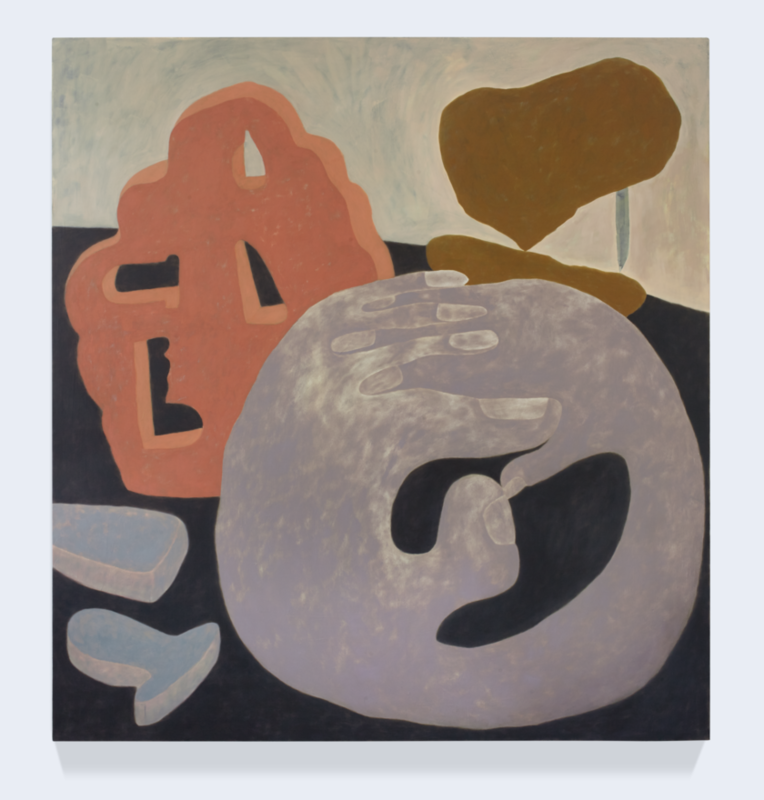 Ginny Casey, Broken Vase, 2015, oil on canvas, 55 x 55 inches. “Ginny Casey & Jessi Reaves,” Institute of Contemporary Art, Philadelphia, PA. Through August 6, 2017.